snowdeal.org > ex machina: the eric update - day 1110: enjoying being three at a - at least for now - great lake. 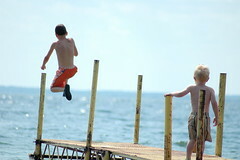 the eric update - day 1110: enjoying being three at a - at least for now - great lake. i suppose now is not the time to talk with him about how pollution levels in the great lakes are, once again, on the rise, potentially threatening human health.